Fall and winter are some of the best times of the year for driving. Being able to retract the roof on your car and feel the crisp cool breeze in your hair during the winter is probably one of the most enjoyable of life’s simple pleasures. However, with winter comes a few extra precautions you have to take to make sure that your retractable roof and vehicle as a whole stay in working order. Below are some general tips to help you better prepare for the winter months with your convertible. While this may seem obvious, you will want to inspect your vehicle and its retractable roof before the temperatures start to drop to make sure they can take the cold in the first place. Some small things to look out for would be scratches or tears in your soft-top roof, as these could be made worse by the cold temperatures makes your soft top brittle. Additionally, as an overall safety precaution, you will want to make sure that you have the proper tires should you decide to drive through the snow. If you drive a convertible with a soft top, we highly recommend that you store it in the garage over the colder winter months. While your garage may not be toasty warm, it will be much warmer than it would be if your car was left outside, and could prevent a lot of the damage associated with the colder temperatures. However, if you are unable to store your vehicle in a garage, regular maintenance on the retractable roof will make sure that it stays in top shape throughout the winter. One of the best things you can do for your soft top is to clean off any snow or other debris from the roof before you start driving. This is both courteous to your fellow drivers, as large chunks of ice or debris won’t be falling off your vehicle, but also beneficial for your safety. Convertible soft-top roofs are only designed to support so much weight, and letting snow and ice accumulate on the top of your soft top could cause the seams to weaken or water to soak through once the snow thaws. If you have a soft top that features plastic windows, you will want to be sure that you are caring for these properly, as well. 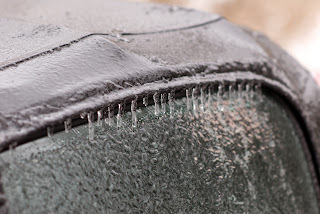 One of the biggest mistakes that soft-top users make during the winter is using an ice scraper on these plastic windows when it gets extra frigid outside. This could seriously damage your windows causing them to shatter like glass because of the extra cold temperatures. It’s best to keep the roof up until the ice on these windows has loosened or thawed before attempting any maintenance. As you can see, it only takes a little extra maintenance in the winter to keep your soft-top convertible running wild and free as the seasons begin to change. By taking these simple steps to take care of your soft top now, you’ll be able to enjoy your convertible safely into the spring and summer. How do you keep your convertible tops looking like new during the harsh changing seasons? Share your tips in the comments below! There’s something magical about the fall season. The weather cools to a pleasantly crisp temperature, the leaves on the trees begin to lighten and everyone seems to be in a happier mood. All of this makes us want to take drop the top on our convertibles and let our hair fly free while we drive down an endless scenic highway. While there isn’t a never-ending highway we can enjoy this fall, there are quite a few magical routes along the East Coast that are almost too good to be true. Below are some of our suggestions for where you can get the best view of the fall scenery from your convertible this season. Running between the Carolinas and Virginia, this 500-mile scenic route is the quintessential scenic drive for fall. Connecting two of the most beautiful places in the country, Shenandoah National Park and the Great Smoky Mountains, this route plays stage to one of the most fantastic fall spectacles in the country. Be amazed as you see the brilliant colored trees along the route imprinted against the beautiful and imposing Great Smoky Mountains, which define this region. If you happen to be in this area, you absolutely cannot miss the chance to experience this once in a lifetime road trip. The Florida Keys are gorgeous no matter the season, so obviously we would include them on this list for one of the best scenic drives for fall. 120 miles long and running through the Florida keys, U.S. 1 is a route that every avid road tripper should take in their lifetime. Beyond the year round gorgeous scenery, each island in the keys offers its own unique and eclectic feel, all of which makes for a great family road trip for the fall. Nestled between New Hampshire’s White Mountains, this modest 36-mile highway is a paradise for anyone who loves to gaze for hours at the changing fall colors. As you drive down this scenic highway, it feels as though you are being wrapped in a brilliantly colored autumn blanket as the highway curves through the peaks and valleys of the beautiful White Mountains. As an added bonus, being in New Hampshire means that much of the surrounding flora on display is Maple. We highly recommend taking time to stop along your journey, hike through these forests to see these beautiful Maple trees up close and maybe even snag some sap if you’re lucky. Although a short drive at only 10 miles long, this Newport, Rhode Island coastal road packs a punch of natural beauty and American history. While the views of the ocean and the changing foliage are on full display, the real draw of Ocean Drive comes from estates located along its seaside path. This part of the country is famous for playing host to the vacation homes of some of the wealthiest and famous family dynasties in history with previous residents including the Vanderbilts, Astors, Belmonts and Morgans. Be sure you take a moment to admire some of the massive estates as you explore this fantastic drive. If you plan to do any sort of fall road trip in the East Coast, you absolutely cannot miss this 118-mile stretch of road that connects the Cape Cod region of Massachusetts to the natural beauty of the state. There’s not much to be said about this route except that it gives you a true cornucopia of fall scenes from the exciting changing colors of trees to the calm serenity of tidal pools along the New England Coast. As you can see, there are so many options for how you can experience fall on the road this season. However, in every case, you won’t be able to fully appreciate the grandeur of these routes if you can’t enjoy them with all the sensations and smells that come with the fall season. Take a look at one of our many retractable roof options for your car and enjoy this fall to the fullest!